I haven’t been around the social media world much lately. In fact, this is the longest I’ve gone without a Mapping the Edge post since I started it last year. We are packing up and getting the house ready for the market in a few weeks. We have no clue how quickly the house will sell, but it is priced to sell, and we are moving. Let me clarify. We are not so much moving as moving on. Plans include a temporary stay in southern West Virginia where my wife, Alane, and I were born. I say temporary because we plan to stay with family for a month or two while we see if we want to make West Virginia a more permanent home. Regardless, while in the state, I plan to pursue the ideas I presented in Destroying the Myth of Appalachia. The engineer in me is uncomfortable with squishy plans on the backside of our detailed front-end plan. It may be logical to spend time searching out an area before investing in land or a house, but the engineer is not accustomed to stepping into the unknown, at least not without a way to at least predict the path ahead (see my Drunk in a Tunnel post for more on the subject)! God bless the Markov process! In contrast, the artist in me is loving it! Finally, I’m off on a new adventure into the unknown. Even if the discovery is learning about areas where we’d rather not live, it’s a discovery. It feels like when we push an idea to the very edge, then over it. Sometimes it goes splat and creates a bloody mess. Sometimes it creates combinations of pretty colors that we’d never have come up with any other way. Ironically, it’s the work-from-home engineering job that is allowing this adventure to take place. We may end up back in the Appalachian Mountains of West Virginia. We’ve talked about buying land in a remote location, and building a house and artist studio. There, I can make stuff – write, draw, paint, and do wet plate collodion and other photographic processes. There, I can offer workshops and courses, and continue to build the Mapping the Edge brand. We may end up back in Atlanta, Georgia. We both love the Marietta/Atlanta area. I’d be closer to some of my favorite fine artists and galleries, and back in a city that embraces photography of all types and processes. There are remote areas in the deep south that I’d love to live and work. There are major cities, like Atlanta, that I find appealing. Sometimes, it’s as inspiring to think about living in the midst of busy streets as it is to picture a remote studio with a 360-degree view of nature. Or we may end up in someplace we’ve yet to learn about. Who knows? We may see something driving back home, look at each other, and decide to go no further. We honestly have no idea. We’ve even talked about buying an RV and living and working on the road for a while. Regardless of our final destination, I’m experiencing something unexpected as I sort and pack and store and sell and give away. I’m going through grief for life as I know it and as we’ve built it. I expected it but not this strong. Sometimes change is necessary, even if painful. My life here is like that tree growing next to a fence post. Twenty-five years ago, it seemed natural when my root tips first touched the fence post of where we live. It was wood touching wood, and it felt like making a new friend. Now, it feels like my roots have become entangled around a foreign object. It’s caused me to grow funny over the years. Just like when we notice ourselves age, it didn’t happen gradually. It was sudden and drastic. Time for a transplant. To be transplanted means to cut the roots away from the old ground. It’s invasive, traumatic, and violent. Ever notice how hard it is to let go of something you’ve held onto for a long time? Your fingers ache as you pry them away. It can also be a good kind of pain. Letting go is seldom the hardest part. The most difficult part of the process is letting go of the holding on. 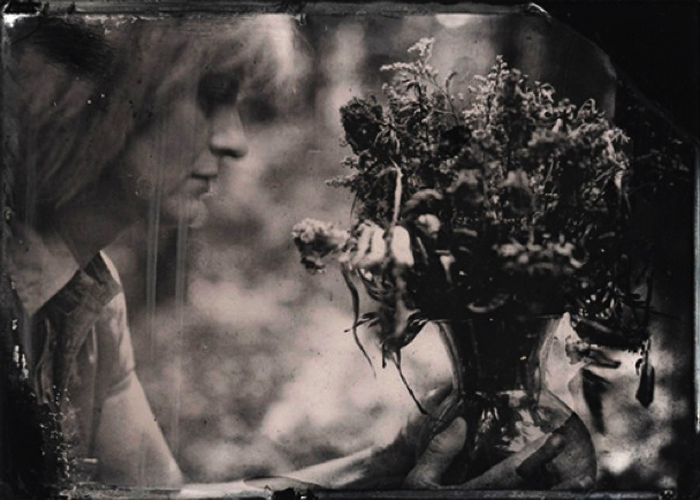 This wet plate collodion image of Alane sums up my feelings on the subject. I’ve renamed the plate twice since I first created it on a 5×7 piece of glass in 2008. It’s new title is, “Letting Go of Holding On”. I think the new title may become permanent. For now. Just found this again. I think “splat and it’s a bloody mess” describes it. I can’t believe that this was written almost two years ago. Where does time go? Just now, two years later, we are getting settled and getting unsettled at the same time. Plans…..haha. I love and hate the infrequency of normal in life. Ours especially. I want to say I’m letting go of holding on, but I can’t. I’m very much entangled. Roots are deep and strong . You, Mr. Vinson, are a visionary and a prophet.